Last time, our Editor-in-Chief, Bryce Merkl Sasaki, pivoted away from video and onto the podcast medium to highlight a recent Exponential View interview with CEO and Co-Founder of Neo4j, Emil Eifrem. Great stuff. Did you know that currently there are more articles out in the world than people to validate them? This week, I’d like to unearth a two-part video series on the fake news epidemic and how a graph database, along with machine learning, is capable of revealing patterns in seriously divergent data. 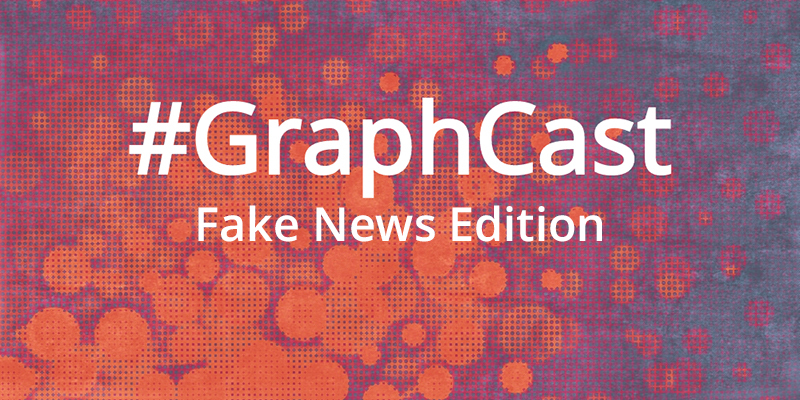 In Part One, Nir Avrahamov talks about how a graph-based solution – using graph analytics and machine learning – can aid human fact checkers by automating a portion of their process in order to increase the speed, efficiency and scalability of fake news detection. Separating fact from fiction is of paramount importance in today’s sweeping digital social landscape. According to a huge report issued by Science last year, lies are spreading faster than the truth. NBC News, using Neo4j, were able to assemble a subset of removed tTweets and accounts from Twitter, and analyzed the data to help make sense of what the Russian Troll Network was doing. Last year, they open sourced the data in hopes others could learn from the dataset, contribute to a combined database and help prevent future fake news abuse.